I had watched The Strain some time ago knowing that Guillermo del Toro had written the main storyline. It was great and suspense full. Curious how the book was I looked around for it and eventually I found it. I thought it was an okay story and very suspenseful. So begins a battle of mammoth proportions as the vampiric virus that has infected New York begins to spill out into the streets. Eph, who is joined by Setrakian and a motley crew of fighters, must now find a way to stop the contagion and save his city – a city that includes his wife and son – before it is too late. 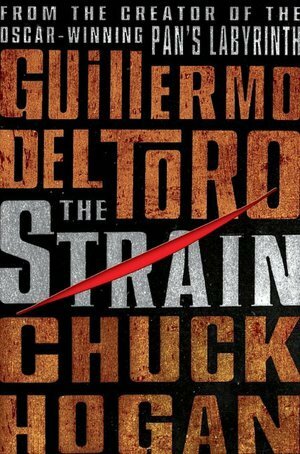 I give The Strain by Guillermo del Toro and Chuck Hogan three out of five hearts because it was a suspenseful story, but it wasn’t the greatest and had the same problem as the tv-series had. It dragged on. I do think the premise sounds really great, but it didn’t come out that well. I don’t know how much of it is Guillermo, but I loved Pans Labyrinth. Abraham is an elderly man who knows a lot about this vampiric virus that is going around in the city. He is hunting The Master. But he seemed to be the only character with the deepest development. The rest of the characters felt thin and flat. Overall I think The Strain is not worth reading. It started out suspenseful, but then it just drags on and bored me. The TV-series started out really great and I really wanted to know where it was going, since I hadn’t read the book yet. But by the end of the first season, I felt it was dragging and got bored with it. I was so disappointed. I do think the tv series followed the book pretty well and that was great, but also the only great thing. This entry was posted in Book Review and tagged Book Review, Chuck Hogan, Drama, Fantasy, Guillermo del Toro, Horror, Mystery. Bookmark the permalink.